Dear lord have I had lots of contest ideas lately. It may be hard to judge them all! Hello, and welcome to my newest contest... oh what's that? I've already done this one? Well, I don't care, I'm doing it anyways. This contest is all about creating flipping planeswalkers. That is, planeswalkers that flip. -Must be a double-faced card with a planeswalker as at least one of the sides. The other side is up to you. -Cards must be made after August 23. -Only 1 entry per smith. -1st Place gets 5 favorites and a Follow. If I am already following, you get an extra favorite. -2nd Place gets 4 favorites and a Follow. If I am already following, you get an extra favorite. -3rd Place gets 3 favorites and a Follow. If I am already following, you get an extra favorite. Cards will be judged on September 10. Cards will be judged on flavor, balance, creativity, and spelling/grammar. Listing the artist isn't necessary, but will help break ties. DISCLAIMER: You can still post cards for this contest. This is the judging of an old contest that I never judged. I apparently dropped off the face of MTGCardsmith before judging the last iteration of this contest, so what the heck, let's do it now. 3rd place goes to @sorinjace with Skullbrander, Heartless Theif, and Skullbrander, Cursed Soul. 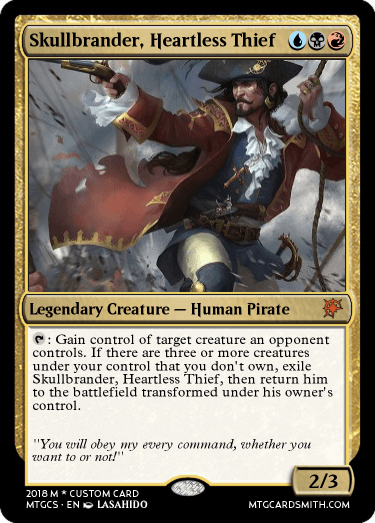 The way that he flips is really cool, and he would make an interesting commander! 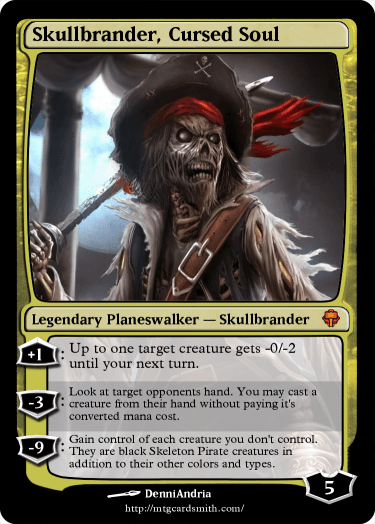 And the thought of a zombie planeswalker is really cool. All around good job! 2nd Place goes to @TezzeretofCarmot21 with Victor, Lord of Seeds, and Victor Hale, Sparkless. 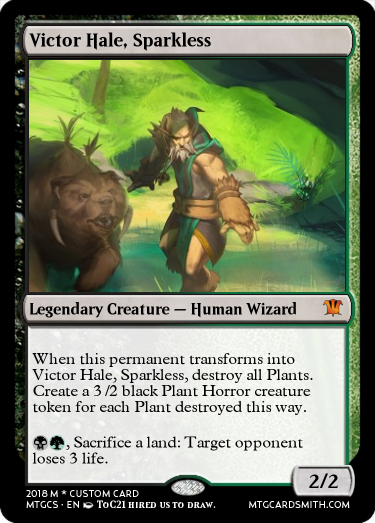 I really like the concept of a planeswalker losing their spark, and having a planeswalker turn into a creature instead of the other way around is really cool! Great job! 1st Place goes to @MrPirate89, with Whispering Axe and Balzoreth, the Deciever. 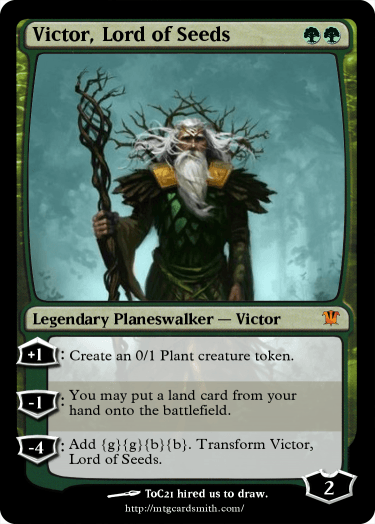 A planeswalker coming from an equipment is a really cool concept, and I personally love it! Awesome job with it! You guys probably forgot you entered this contest, didn't you? Well, you won! Good for you! Tell me the cards you want me to favorite in the comments. @Aggroman15 wow, how long ago was this? Skullbrander is my main villain in my custom set called Sagara Undersieged I haven't worked on that in a long time but dechujoh64 and aryanf have as well. https://mtgcardsmith.com/view/masheep-gun-kelley by @lostcause626 her cards crack me up! @sorinjace It was started on April 15. The link to the contest is here. Yeah, something else must have caught my attention sometime after that, because I basically abandoned cardsmith sometime before I was supposed to judge that contest. Can you favorite these two cards? Can we get another one?